I will always remember this day for loads of happiness, life, excitement, josh and high doses of energy around me! Thanks to the kids from Asha Kirana Nele - angels with beaming eyes! We reached the venue near Gottigere, Bannerghatta Road well before the scheduled time, met up with the staff at Nele. With in 5-10 mins the little ones marched into their home with heavy school bags. We waited for all of them to come back from school so that we could start off our Teacher's Day toy distribution event for Toybank. Trust me, I couldn't wait any longer! Center in-charge, A S Patil was telling us that the identified kids are brought to the Nele Home and they are given a 3 month bridge course to help them get used to going to school. And later, they are admitted into a school. We were so happy when we heard that this Govt School was right beside the home. By 11 30, all the kids were back from school. We had an 'Intro Please' game with all the kids. We asked them to say their name, class in which they are studying and yes, along with this we asked them to sing a song or give us a dance performance. What happened next? You should have been there with us to enjoy all that what happened after that!! My visits to NGOs in the past had me see an average of 60% of the kids who are very enthu and energetic but still there's always this remaining 40% group which remains shy and reserved! But how can ALL the kids at Nele be superrrrrrr talented, superrrrrrrrr smart, full of discipline and have a lot of cultural values which exactly mirrors Nele's vision statement! Also I observed a very nice thing that all the smaller kids in the home greet all the elder ones when they meet each other. We had told the kids not to repeat any song in the “Intro Please”. And guess what… there were 32 kids and each one sang us a different song!! Even if any of the kids sang a song which was already sung and we stopped them, they didn’t back out!! They went ahead and sang us a brand new poem/song. 2 groups gave us dance performances for songs about the nation and the state. Only one kid sang “Anisuthide yaako indu” from Mungaaru Male, a recent blockbuster in Kannada Film Industry and one sang from Sivaji – a Tamil blockbuster. This took us by surprise coz these were the only “film songs” the kids sang, rest all of them being Kannada poems taught to them in school. We had planned a 2 hour event with the kids, but seeing their immense talent and excitement we pushed it close to 3 hours as we wanted all children to get a chance to showcase their talent. We didn’t have to plan any games and organize any fun activities. We were already having so much of FUN! There was absolutely no need to plan any more games to entertain the kids. After the Intro Please, we distributed chocolates to the kids and then happened the 2nd “toy distribution event” for Toybank. We gave around 30 toys to the home which included soft toys, kitchen toys, cars, bikes, etc. 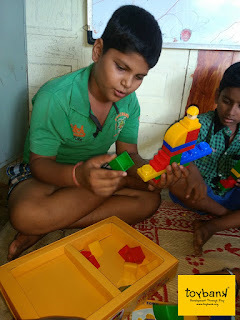 There are these other toys, something we have termed the ‘teacher toys’ :) which we give it to the teachers/care-takers at an NGO, so that they make all the kids play/use them for group games. Nele had a play space, now it'll have a 'toy space'. 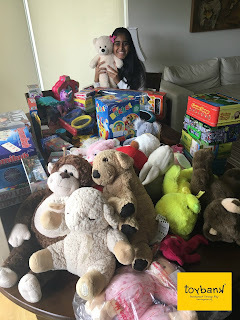 All these toys will now go to the 'toy space' in Asha Kirana Nele where all kids can play with them. The kids went on to dedicate a song to their teachers at Nele giving them all the respect they deserve! “akka neevu nam jote bandu oota maadi…ondu sari banni…banni akka…” [“Sis come and have lunch with us…just one time…please come sis”]. I was happy, excited and yes speechless! :). I am sure all the people who know me the best want me to stay ‘speechless’ all the time :P. Jokes apart…this emotion can never be expressed in just a few words!